Is Pitavastatin (Livalo) A Better Statin For You? The skeptical cardiologist recognizes that perhaps 10% of patients he starts on a statin drug will develop symptoms that are felt to be due to the drug. Most often the symptom is myalgia-muscle ache. But other symptoms may develop after the patient starts the drug and given widespread statin fear-mongering on the internet it is common for these symptoms to be attributed to the statin. My doctor had me on a daily 40mg Lipitor. After about 1 month, I noticed that my short term memory was very bad*. (Not a nocebo effect… I had no idea at the time that statins were linked to memory effects.) I did an experiment on myself. I suspected that my memory problems were the result of the statin. (Nothing else seemed to be different besides the fact that I had started taking Lipitor the previous month.) After 2 weeks off of Lipitor, my memory problems went away. Whew. I put myself back on Lipitor (I didn’t want to die of a heart attack, and my “experiment” could have been a victim of confirmation bias + 100 other faults.) After about a month, crappy short term memory returned. Took myself off Lipitor again. AGAIN, after about 2 weeks, by memory was fine again. Perhaps my experiment wasn’t scientific. Just one subject (me). 100% anecdotal. Perhaps statins are good for your heart. However, I don’t know about you, but I program computers for a living. Try doing that with crappy short term memory. Hint: you can’t do it. I’ve outlined my approach to these potential statin associated symptoms (PSAS) previously (see here) and if a patient has resolution of the PSAS we typically try another statin to see if the PSAS recurs. For my reader, it would make sense to try a statin like rosuvastatin or pitavastatin that is hydrophilic and therefore doesn’t cross the blood-brain barrier and enter the brain. For the more common myalgias I typically try rosuvastatin at lower dosage. If symptoms recur on rosuvastatin I try pitavastatin. Pitavastatin (Livalo) is the seventh statin. It is minimally affected by the cytochrome P450 system (meaning less drug-drug interactions), water soluble (so it doesn’t enter the brain,) and does not lower Co-enzyme Q10. These special biochemical characteristics raise the possibility that among patients who have not been able to tolerate other statins it might be both usable and efficacious. The Medical Letter’s review of pitavastatin calcium concluded that recommended doses of the drug had not been shown to decrease LDL-C more than other statins with longer safety records and there was no good reason to use it. That conclusion applies to pitavastatin magnesium as well. regressing plaque volume as was atorvastatin in an IVUS trial called JAPAN-ACS ((J Am Coll Cardiol 2009;54:293–302). 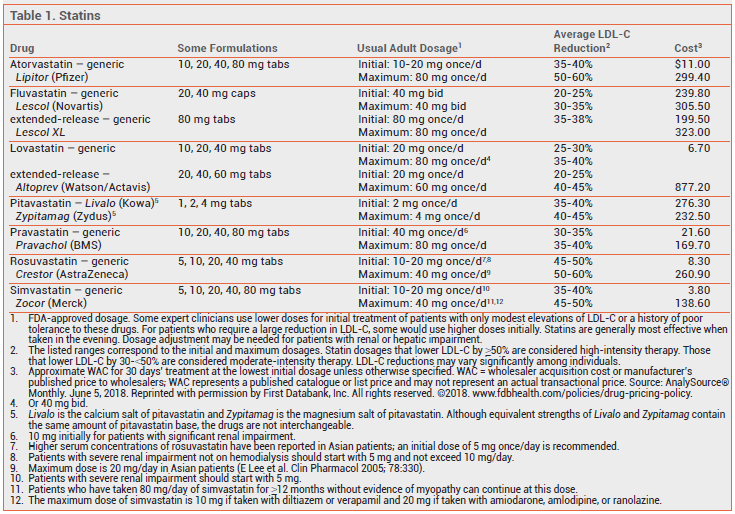 The claim regarding LDL lowering is erroneous as pitavastatin is actually more efficacious than fluvastatin, pravastatin, lovastatin, and 10 & 20 mg doses of simvastatin and the last sentence in the Medical Letter using the word “worrisome” is both ridiculous and 100% false – The pharmacokinetics of pitavastatin are extremely clean, better than all of the more lipophilic statins now on the market except fluvastatin (read the reference cited above which compares pitavastatin to all other statins using published data not invective). I cannot remember the last branded drug that was not first in its class to be released that the Medical Letter found any use for including Crestor which is why personally I find little use whatsoever for recommendations of the medical letter. Thus, there is no reason to use any brand name statin unless you have developed side effects on two generic statins with the second one being low dose rosuvastatin. Four years ago I identified by vascular screening in one of my patients, a 65 year old woman a >50% blockage in the left carotid artery. We started her on 40 mg atorvastatin and she developed a rash. She was switched to rosuvastatin 10 mg and began waking up in the middle of the night with a headache and feeling light-headed. I thought it unlikely this symptom was due to the statin. We stopped the atorvastatin and a month later she called back indicating that she could feel her arteries clogging. At this time we started Livalo at 2 mg twice weekly. LDL dropped by 50% to 71 mg/dl and she has tolerated it without side effects ever since. Beyond anecdotal support for pitavastatin in the statin intolerant patient we have one abstract presented at the ACC meetings in 2013. A total of 40 consecutive patients with documented intolerance to any dose of at least two different statins were prospectively enrolled into a protocol whereby they received a trial of pitavastatin therapy at a dose of 2 mg per day. Forty patients were enrolled and 27 of them (68%) were able to tolerate pitavastatin. LDL cholesterol was reduced from 147±27 mg/dL to 93±25 mg/dL, resulting in an average LDL-cholesterol reduction of 34%. Patients who could best tolerate pitavastatin tended to be males and those with no history of coronary artery disease or diabetes. Despite what the Medical Letter says about pitavastatin I tend to agree with Tom Dayspring and I and most progressive preventive cardiologists will give pitavastatin at least a trial in our high risk patients with PSAS before giving up on statins in them. N.B. Pitavastatin was discovered in Japan by Nissan Chemical Industries and developed further by Kowa Pharmaceuticals, Tokyo. It has been extensively studied in Japanese studies. Pharmacokinetic investigations have noted higher plasma levels of statins in Asians compared with Caucasians, although postmarketing data for all statins have not identified any particular safety issues, even when statins are given at equivalent doses. The potential mechanisms of heightened response to statins in Asians are related to genetically based differences in the metabolism of statins at the level of hepatic enzymes and drug transporters. Studies indicate that lower statin doses achieve lipid improvements in Asian patients comparable with those observed with higher doses in Caucasians. In conclusion, prescribing lower starting doses of statins in Asians appears warranted while research on this subject continues.